Arctic sea ice isn’t just threatened by the melting of ice around its edges, a new study has found: Warmer water that originated hundreds of miles away has penetrated deep into the interior of the Arctic. That “archived” heat, currently trapped below the surface, has the potential to melt the region’s entire sea-ice pack if it reaches the surface, researchers say. The study appears online Aug. 29 in the journal Science Advances. 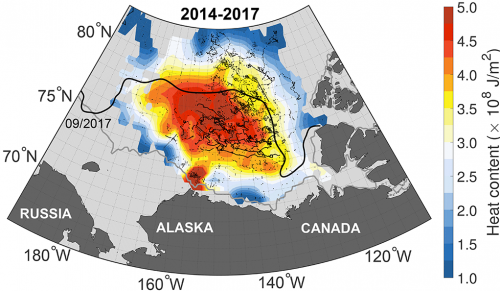 “We document a striking ocean warming in one of the main basins of the interior Arctic Ocean, the Canadian Basin,” said lead author Mary-Louise Timmermans, a professor of geology and geophysics at Yale University. The upper ocean in the Canadian Basin has seen a two-fold increase in heat content over the past 30 years, the researchers said. They traced the source to waters hundreds of miles to the south, where reduced sea ice has left the surface ocean more exposed to summer solar warming. In turn, Arctic winds are driving the warmer water north, but below the surface waters. The co-authors of the study are John Toole and Richard Krishfield of the Woods Hole Oceanographic Institution. The National Science Foundation Division of Polar Programs provided support for the research.